My love and adoration of soup has been a cornerstone of this site down the years. Accordingly, it seemed fitting that the day following the announcement that the daily Lunchquest reviews would cease soon after my return to Edinburgh, I stumbled across a place in Milan offering what looked to be a soup tasting menu. 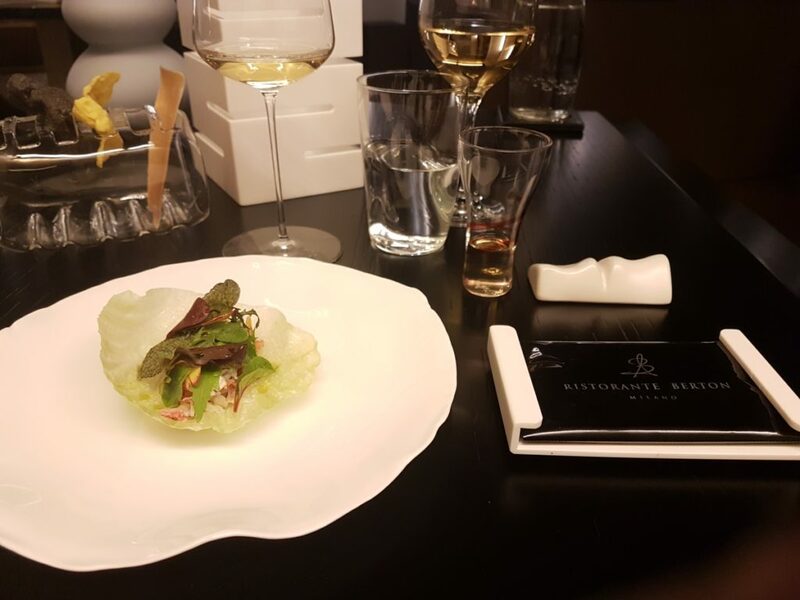 The place in question was Ristorante Berton, a 1 Michelin star place within a ten minute stroll from where I was staying. The soupy menu was called Tutto Brodo and it was indeed one of the options as I perused the menu. 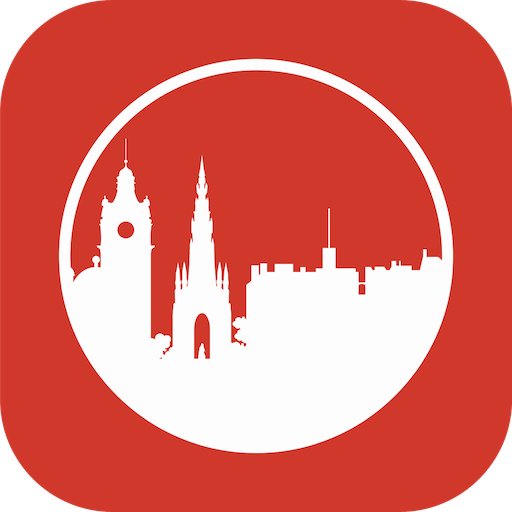 From a reading of the list, it became clear that rather than a succession of soup courses – something I would have entirely relished – this was a menu where soups and broths featured with or as part of each course. 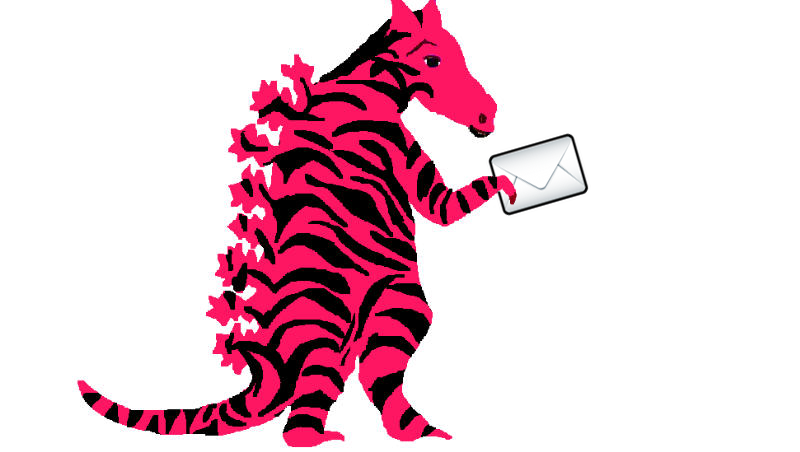 This still strongly appealed so I went ahead and ordered it. It had been a fairly long day so I opted for an abbreviated wine pairing with three glasses matched to the eight courses. The wines were carefully curated local drops of very good quality. First up were some little snacks including a pesto cannolo, some airy tomato bread and a rather unappealing looking taco with the shell made from a thin layer of celeriac. These were to a good standard. The first course again riffed with the taco theme with a lettuce leaf playing taco shell this time encasing a crab salad. The accompanying fennel and anise broth brought good fresh aromatics. 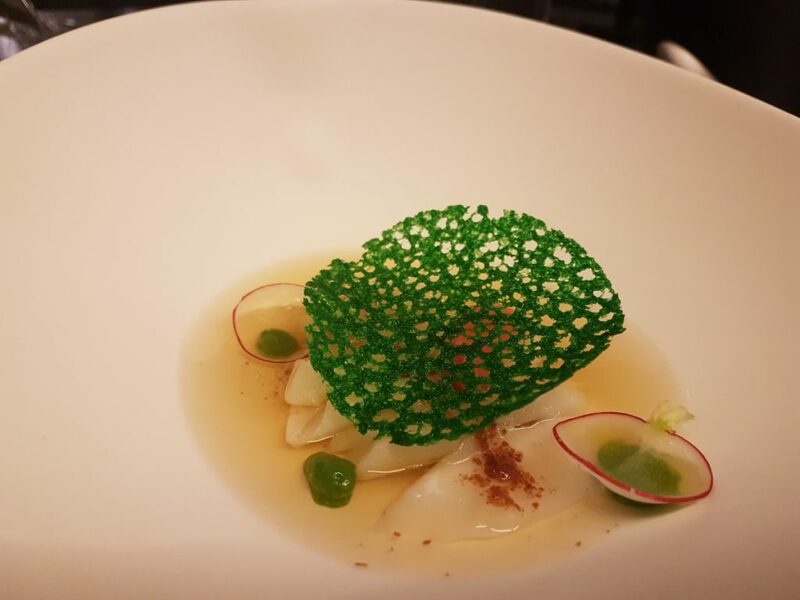 We moved on to a dish of raw cod flakes with a lacy parsley tuille in a prosciutto broth. This looked beautiful and was flavour packed. 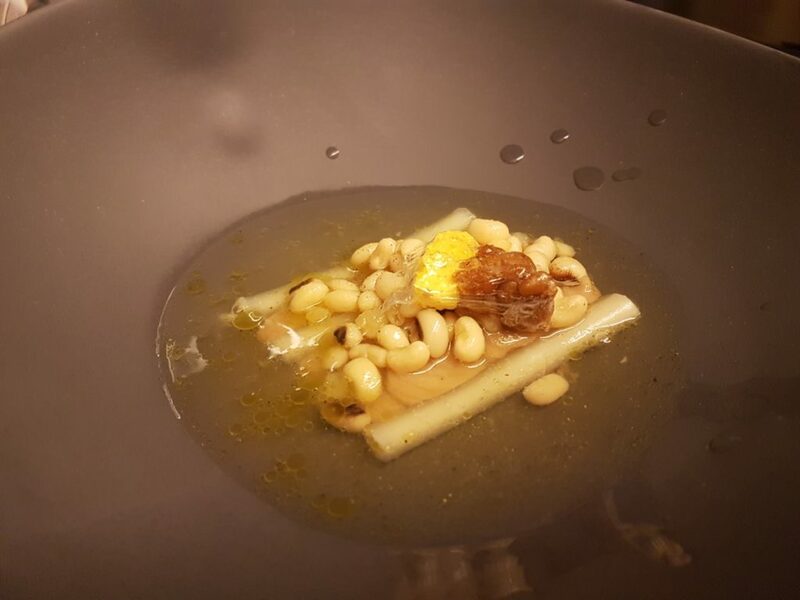 We then had a playful take on the classic pasta e fagioli with a stock bag atop zitti pasta and beans dissolved by an onion broth. 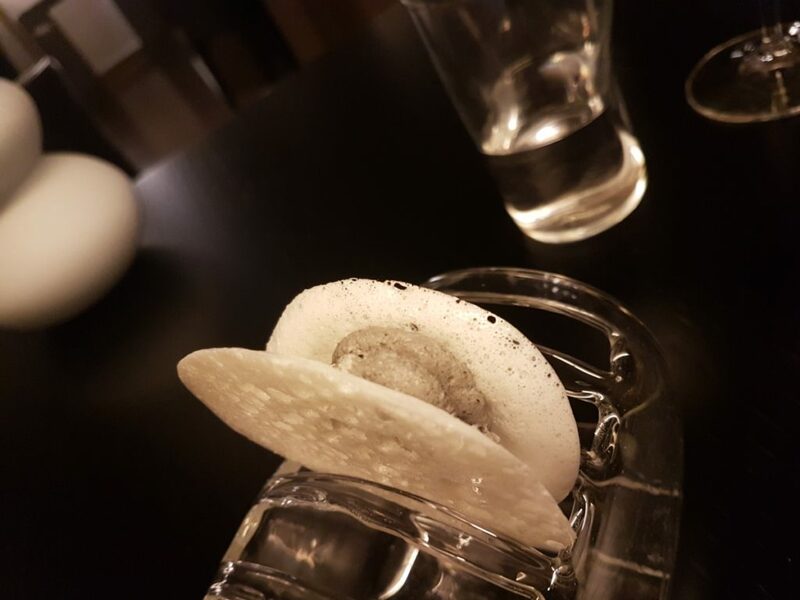 The logistics of this didn’t work quite as they should have as the onion broth was neither warm nor plentiful enough to fully dissolve the gel casing of the stock bag leaving some odd textural globs. We had another slightly clunky dish to follow with ravioli, a prawn sashimi atop toast and lobster broth. These were presented to be eaten consecutively and interchangeably. The fluid filling of the ravioli was overpoweringly garlicky, then the texture of the bread used for the toast was too dense making that element a tough eat. The broth was delicious but the mechanics of the dish didn’t work. Then came the outstanding course of the evening. 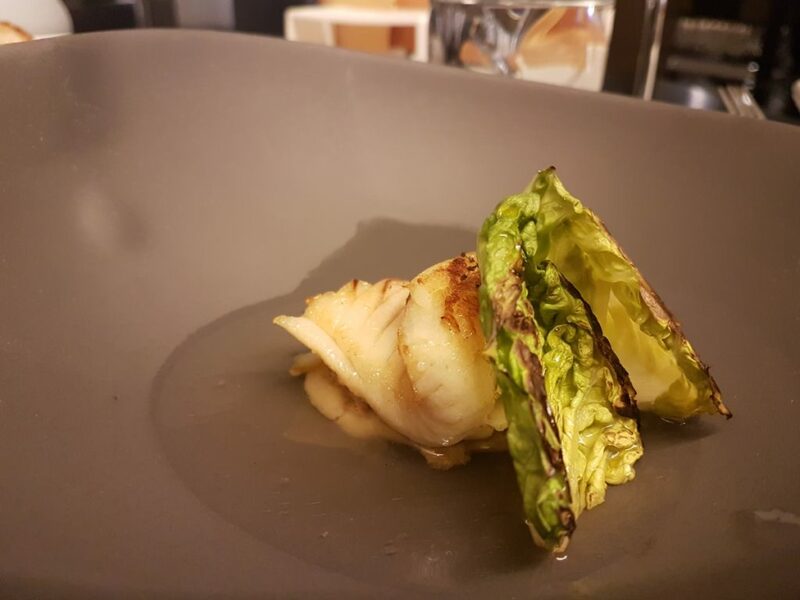 Ray fish was topped with charred endive then served in a crackerjack green olive broth. The broth was amazing and the dish came together beautifully. 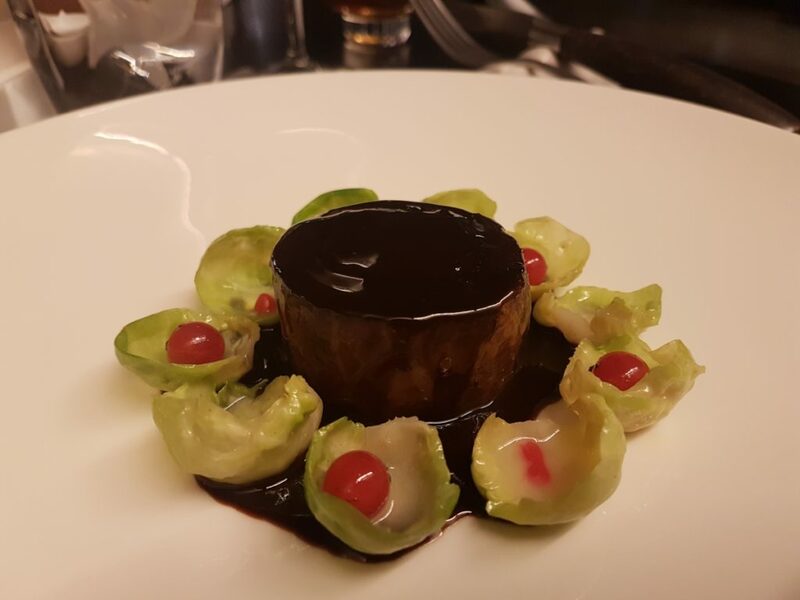 Hare with brussels sprout leaves and red currants was the main course. This was served with a hare broth that was topped at the table with a grappa spritz. This was unusual but pleasing stuff. 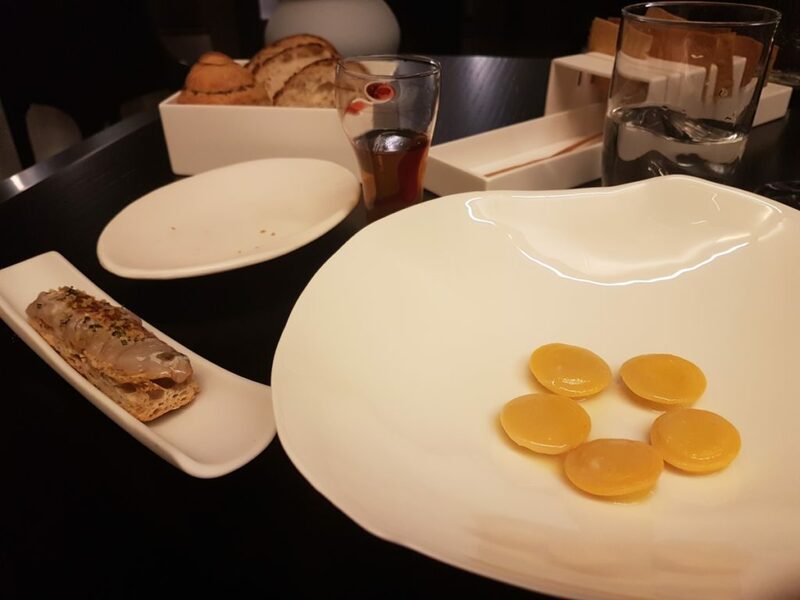 After a zingy palate cleanser of chocolate sorbet with intensely sour grapefruit, we next had a puffed wafer sandwich with black sesame and kumquat filling served with a clarified chocolate broth. This was oddly ephemeral. 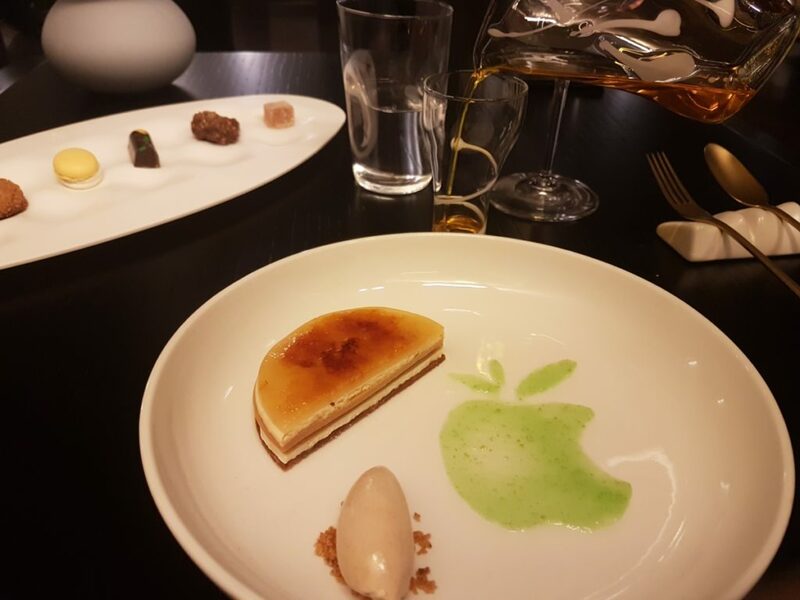 The main dessert was an apple tarte with elegant apple cream presentation and cinammon ice cream. This was served with a satisfyingly sweet apple and saffron broth. 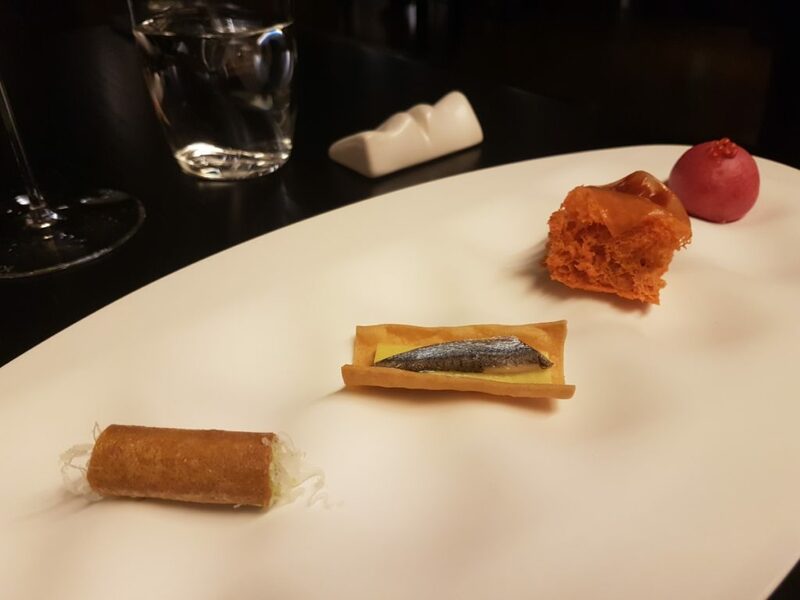 As I sampled some excellent petit fours with my espresso, I was left to ponder a meal of highs and lows. Overall, this was a slightly hard meal to assess. When it was good it was really excellent, but the logic and logistics of some of the dishes just didn’t work. I’m all for the kitchen instructing diners how particular dishes should best be eaten, but the complex elements at play in this often challenging menu jarred and clunked too often. The general standard of cooking was still very high but it definitely felt like refinement was needed to enhance the overall effect of the meal.